Can You Reheat Dumplings? | Can You Reheat? Q: When I order takeout, I always get steamed dumplings. Recently, I ordered extra on accident and was totally clueless on how to reheat them. I used the microwave, and they turned out pretty good, is there another, more conventional way to reheat steamed dumplings? A: Reheating your leftovers is quite easy, and while steaming your dumplings is not a good idea, you can always use your microwave or skillet. You should not steam them because they tend to become mushy by the time the meat is heated through. To reheat your dumplings in a skillet, add about three tablespoons of water to the pan, which will be enough to ensure they do not dry out. Place the dumplings in the skillet and heat over medium- low heat, and cover. Covering the dumplings is important to not only keep in the moisture, but to heat more evenly. When you are in a rush, nothing is better than popping some leftover into the microwave and heating it up for a quick lunch. 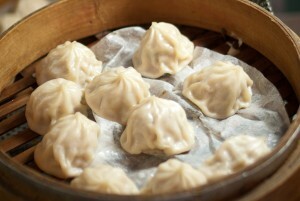 To reheat dumplings, simply, place them in a microwave-safe container, preferably one with a lid. Add one tablespoon of water and loosely cover. Microwave for 45 seconds. To ensure you heat the middle, you may want to cut them in half before heating. If you do, microwave for 30 seconds and check for the desired warmth. While many will eat their leftovers cold, nothing is better than having your dumplings reheated. Their flavors are seemingly better come the second day, and they tend not to be as thick in your mouth. Remember that for any food, heating times may vary depending on the appliance, so use a thermometer or the tip of your finger to check for the desired warmth!